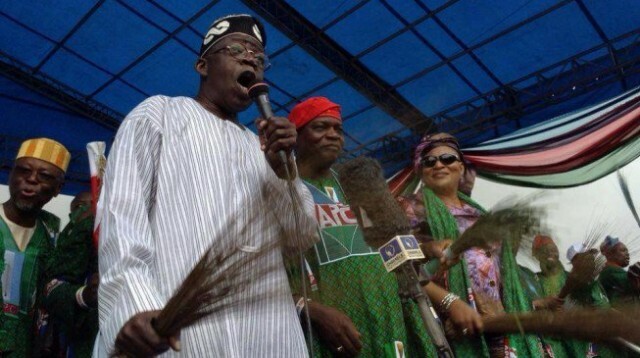 Ahead of the governorship election in Osun State this weekend, a national leader of the All Progressives Congress and former Lagos State governor, Asiwaju Bola Ahmed Tinubu, has urged the people not to be deterred, admonishing them that “you cannot eat omelet without breaking an egg”. Tinubu, who addressed a huge crowd of supporters that turned out for the party’s mega rally for the re-election of Governor Rauf Aregbesola at the Township Stadium, Osogbo, also accused President Goodluck Jonathan of ineptitude. On Saturday’s gubernatorial poll and the president’s directive for Osun to be heavily policed, Tinubu said: “Don’t be intimidated by the soldiers or police. We give them their uniform and pay their salaries. We won’t allow anybody to use police and soldiers to harrass us. Our party agents should not take bribe from anybody to sabotage the election. If you stand firm you will be the first set of people to be recruited for jobs when it is time for it”. Tinubu pointed out President Jonathan’s failure in many sectors, especially with regards to the abducted Chibok schoolgirls, “They keep saying they know where the kidnapped girls are kept. If truly they know, let them bring them out and if it is the enemies that keep them and they know, it means they are saying they should be taken away”. He continued: “It is a broom revolution. You must come out, everyone of you to cast your vote. Don’t be afraid of the police or the soldiers. They are paid to protect you. They are part of us. We have them in our families. “We know them. We must be careful and vigilant this time. But we must protect our votes. The soldiers are to protect you. They cannot use the uniform to steal our votes. Defend your votes. Our agents must be vigilant. “Jonathan is an incapable leader. He does not know this job. Where are our girls? They say they know where the girls are. If so, why not bring them out and set them free. Bring back the girls. APC is a party of the common man. Don’t be intimidated. “Tell the soldiers to let you perform your civic duty. Police affairs minister and some PDP chieftain are bragging that Aregbesola will not win a single local government. It seems they have seen the results before the voting. “They seem to know what you don’t know. We will win Osun State. They governor has performed. He is constantly working for the people”, the former Lagos governor said. Aside from APC National Chairman, Chief John Odigie-Oyegun, Osun State Governor, Rauf Aregbesola, Edo State governor, Adams Oshiomole; Oyo State governor, Abiola Ajimobi; a former chairman of the party, Bisi Akande, Ogun State governor, Ibikunle Amosun; Imo State governor, Rochas Okorocha; Kwara State governor, Abdulfattah Ahmed; his predecessor in office, Senator Bukola Saraki, former governors of Osun State, Isiaka Adeleke and Olagunsoye Oyinlola, as well as other leaders of the party were present at the rally. 6ix9ine, Nicki Minaj Set For Collabo?